The Visigoths (/ˈvɪzɪɡɒθs/; Latin: Visigothi, Wisigothi, Vesi, Visi, Wesi, Wisi) were the western branches of the nomadic tribes of Germanic peoples referred to collectively as the Goths. These tribes flourished and spread throughout the late Roman Empire in Late Antiquity, or what is known as the Migration Period. The Visigoths emerged from earlier Gothic groups (possibly the Thervingi) who had invaded the Roman Empire beginning in 376 and had defeated the Romans at the Battle of Adrianople in 378. Relations between the Romans and the Visigoths were variable, alternately warring with one another and making treaties when convenient. The Visigoths invaded Italy under Alaric I and sacked Rome in 410. After the Visigoths sacked Rome, they began settling down, first in southern Gaul and eventually in Hispania, where they founded the Visigothic Kingdom and maintained a presence from the 5th to the 8th centuries AD. The Visigoths first settled in southern Gaul as foederati to the Romans – a relationship established in 418. However, they soon fell out with their Roman hosts (for reasons that are now obscure) and established their own kingdom with its capital at Toulouse. They next extended their authority into Hispania at the expense of the Suebi and Vandals. In 507, however, their rule in Gaul was ended by the Franks under Clovis I, who defeated them in the Battle of Vouillé. After that, the Visigoth kingdom was limited to Hispania, and they never again held territory north of the Pyrenees other than Septimania. A small, elite group of Visigoths came to dominate the governance of that region at the expense of those who had previously ruled there, particularly in the Byzantine province of Spania and the Kingdom of the Suebi. Contemporaneous references to the Gothic tribes use the terms "Vesi" (Latin for Visigoths), "Ostrogothi", "Thervingi", and "Greuthungi". Most scholars have concluded that the terms "Vesi" and "Tervingi" were both used to refer to one particular tribe, while the terms "Ostrogothi" and "Greuthungi" were used to refer to another. Herwig Wolfram points out that while primary sources occasionally list all four names (as in, for example, Gruthungi, Austrogothi, Tervingi, Visi), whenever they mention two different tribes, they always refer either to "the Vesi and the Ostrogothi" or to "the Tervingi and the Greuthungi", and they never pair them up in any other combination. This conclusion is supported by Jordanes, who identified the Visigoth (Vesi) kings from Alaric I to Alaric II as the heirs of the 4th century Tervingian king Athanaric, and the Ostrogoth kings from Theoderic the Great to Theodahad as the heirs of the Greuthungi king Ermanaric. In addition, the Notitia Dignitatum equates the Vesi with the Tervingi in a reference to the years 388–391. Wolfram notes that "Vesi" and "Ostrogothi" were terms each tribe used to boastfully describe itself and argues that "Tervingi" and "Greuthungi" were geographical identifiers each tribe used to describe the other. This would explain why the latter terms dropped out of use shortly after 400, when the Goths were displaced by the Hunnic invasions. As an example of this geographical naming practice, Wolfram cites an account by Zosimus of a group of people living north of the Danube who called themselves "the Scythians" but were called "the Greutungi" by members of a different tribe living north of the Ister. Wolfram believes that the people Zosimus describes were those Tervingi who had remained behind after the Hunnic conquest. For the most part, all of the terms discriminating between different Gothic tribes gradually disappeared after they moved into the Roman Empire. The last indication that the Goths whose king reigned at Toulouse thought of themselves as "Vesi" is found in a panegyric on Avitus by Sidonius Apollinaris dated 1 January 456. Most recent scholars (notably Peter Heather) have concluded that Visigothic group identity emerged only within the Roman Empire. Roger Collins believes that the Visigothic identity emerged from the Gothic War of 376–382 when a collection of Tervingi, Greuthungi, and other "barbarian" contingents banded together in multiethnic foederati (Wolfram's "federate armies") under Alaric I in the eastern Balkans, since they had become a multi ethnic group and could no longer claim to be exclusively Tervingian. The term "Visigoth" was an invention of the 6th century. Cassiodorus, a Roman in the service of Theodoric the Great, invented the term "Visigothic" to match that of "Ostrogothic", terms he thought of as signifying "western Goths" and "eastern Goths" respectively. The western–eastern division was a simplification (and a literary device) of 6th century historians; political realities were more complex. Further, Cassiodorus used the term "Goths" to refer only to the Ostrogoths, whom he served, and reserved the geographical term "Visigoths" for the Gallo-Spanish Goths. This usage, however, was adopted by the Visigoths themselves in their communications with the Byzantine Empire and was still in use in the 7th century. Other names for other Gothic divisions abounded. A "Germanic" Byzantine or Italian author referred to one of the two peoples as the Valagothi, meaning "Roman Goths", and in 469 the Visigoths were called the "Alaric Goths". The name Tervingi may mean "forest people". This is supported by evidence that geographic descriptors were commonly used to distinguish people living north of the Black Sea both before and after Gothic settlement there, by evidence of forest-related names among the Tervingi, and by the lack of evidence for an earlier date for the name pair Tervingi–Greuthungi than the late 3rd century. That the name Tervingi has pre-Pontic, possibly Scandinavian, origins still has support today. The Visigoths are called Wesi or Wisi by Trebellius Pollio, Claudian, and Sidonius Apollinaris. The word is Gothic for "good", implying the "good or worthy people", related to Gothic iusiza "better" and a reflex of Indo-European *wesu "good", akin to Welsh gwiw "excellent", Greek eus "good", Sanskrit vásu-ş "id.". Jordanes relates the tribe's name to a river, though this is most likely a folk etymology or legend like his similar story about the Greuthung name. The Visigoths emerged from the Gothic tribes, most likely a derivative name for the Gutones, a people believed to have their origins in Scandinavia and who migrated southeastwards into eastern Europe. Such understanding of their origins is largely the result of Gothic traditions and their true genesis as a people is as obscure as that of the Franks and Alamanni. The Visigoths spoke an eastern Germanic language that was distinct by the 4th century. Eventually the Gothic language died as a result of contact with other European people during the Middle Ages. Long struggles between the neighboring Vandili and Lugii people with the Goths may have contributed to their earlier exodus into mainland Europe. The vast majority of them settled between the Oder and Vistula rivers until overpopulation (according to Gothic legends or tribal sagas) forced them to move south and east, where they settled just north of the Black Sea. However, this legend is not supported by archaeological evidence so its validity is disputable. Historian Malcolm Todd contends that while this large en masse migration is possible, the movement of Gothic peoples south-east was more likely the result of warrior bands moving closer to the wealth of Ukraine and the cities of the Black Sea coast. Perhaps what is most notable about the Gothic people in this regard was that by the middle of the 3rd century AD, they were "the most formidable military power beyond the lower Danube frontier". Throughout the third and fourth centuries there were numerous conflicts and exchanges of varying types between the Goths and their neighbors. After the Romans withdrew from the territory of Dacia, the local population was subjected to constant invasions by the migratory tribes, among the first being the Goths. In 238, the Goths invaded across the Danube into the Roman province of Moesia, pillaging and exacting payment through hostage taking. During the war with the Persians that year, Goths also appeared in the Roman armies of Gordian III. When subsidies to the Goths were stopped, the Goths organized and in 250 joined a major barbarian invasion led by the Germanic king, Kniva. Success on the battlefield against the Romans inspired additional invasions into the northern Balkans and deeper into Anatolia. Starting in approximately 255, the Goths added a new dimension to their attacks by taking to the sea and invading harbors which brought them into conflict with the Greeks as well. When the city of Pityus fell to the Goths in 256, the Goths were further emboldened. Sometime between 266–267, the Goths raided Greece but when they attempted to move into the Bosporus straits to attack Byzantium, they were repulsed. Along with other Germanic tribes, they attacked further into Anatolia, assaulting Crete and Cyprus on the way; shortly thereafter, they pillaged Troy and the temple of Artemis at Ephesus. Throughout the reign of emperor Constantine the Great, the Visigoths continued to conduct raids on Roman territory south of the Danube River. By 332, relations between the Goths and Romans were stabilized by a treaty but this was not to last. The Goths remained in Dacia until 376, when one of their leaders, Fritigern, appealed to the Roman emperor Valens to be allowed to settle with his people on the south bank of the Danube. Here, they hoped to find refuge from the Huns. Valens permitted this, as he saw in them "a splendid recruiting ground for his army". However, a famine broke out and Rome was unwilling to supply them with either the food they were promised or the land. Generally, the Goths were abused by the Romans, who began forcing the now starving Goths to trade away their children so as to stave off starvation. Open revolt ensued, leading to 6 years of plundering throughout the Balkans, the death of a Roman Emperor and a disastrous defeat of the Roman army. The Battle of Adrianople in 378 was the decisive moment of the war. The Roman forces were slaughtered and the Emperor Valens was killed during the fighting. Precisely how Valens fell remains uncertain but Gothic legend tells of how the emperor was taken to a farmhouse, which was set on fire above his head, a tale made more popular by its symbolic representation of a heretical emperor receiving hell's torment. Many of Rome's leading officers and some of their most elite fighting men died during the battle which struck a major blow to Roman prestige and the Empire's military capabilities. Adrianople shocked the Roman world and eventually forced the Romans to negotiate with and settle the tribe within the empire's boundaries, a development with far-reaching consequences for the eventual fall of Rome. Fourth-century Roman soldier and historian Ammianus Marcellinus ended his chronology of Roman history with this battle. The new emperor, Theodosius I, made peace with the rebels, and this peace held essentially unbroken until Theodosius died in 395. In that year, the Visigoths' most famous king, Alaric I, made a bid for the throne, but controversy and intrigue erupted between the East and West, as General Stilicho tried to maintain his position in the empire. Theodosius was succeeded by his incapable sons: Arcadius in the east and Honorius in the west. In 397, Alaric was named military commander of the eastern Illyrian prefecture by Arcadius. Over the next 15 years, an uneasy peace was broken by occasional conflicts between Alaric and the powerful Germanic generals who commanded the Roman armies in the east and west, wielding the real power of the empire. Finally, after the western general Stilicho was executed by Honorius in 408 and the Roman legions massacred the families of thousands of barbarian soldiers who were trying to assimilate into the Roman empire, Alaric decided to march on Rome. After two defeats in Northern Italy and a siege of Rome ended by a negotiated pay-off, Alaric was cheated by another Roman faction. He resolved to cut the city off by capturing its port. On August 24, 410, however, Alaric's troops entered Rome through the Salarian Gate, and sacked the city. However, Rome, while still the official capital, was no longer the de facto seat of the government of the Western Roman Empire. From the late 370s up to 402, Milan was the seat of government, but after the siege of Milan the Imperial Court moved to Ravenna in 402. Honorius visited Rome often, and after his death in 423 the emperors resided mostly there. Rome's fall severely shook the Empire's confidence, especially in the West. 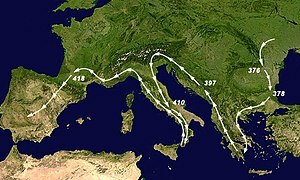 Loaded with booty, Alaric and the Visigoths extracted as much as they could with the intention of leaving Italy from Basilicata to northern Africa. Alaric died before the disembarkation and was buried supposedly near the ruins of Croton. He was succeeded by his wife's brother. 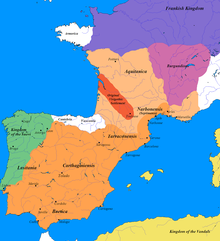 The Visigothic Kingdom was a Western European power in the 5th to 7th centuries, created in Gaul when the Romans lost their control of the western half of their empire. For a brief period, the Visigoths controlled the strongest kingdom in Western Europe. 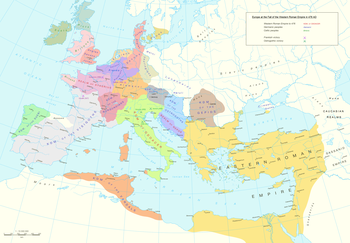 In response to the invasion of Roman Hispania of 409 by the Vandals, Alans and Suebi, Honorius, the emperor in the West, enlisted the aid of the Visigoths to regain control of the territory. From 408 to 410 the Visigoths caused so much damage to Rome and the immediate periphery that nearly a decade later, the provinces in and around the city were only able to contribute one-seventh of their previous tax shares. In 418, Honorius rewarded his Visigothic federates by giving them land in Gallia Aquitania on which to settle after they had attacked the four tribes – Sueves, Asding and Siling Vandala and Alans – who had crossed the Rhine near Mainz the last day of 409 and eventually were invited into Spain by a Roman usurper in the Fall of 409 (the latter two tribes were devastated). This was probably done under hospitalitas, the rules for billeting army soldiers. The settlement formed the nucleus of the future Visigothic kingdom that would eventually expand across the Pyrenees and onto the Iberian peninsula. That Visigothic settlement proved paramount to Europe's future as had it not been for the Visigothic warriors who fought side-by-side with the Roman troops under general Flavius Aetius, it is perhaps possible that Attila would have seized control of Gaul, rather than the Romans being able to retain dominance. The Visigoths' second great king, Euric, unified the various quarreling factions among the Visigoths and, in 475, forced the Roman government to come to terms, but the emperor did not legally recognize Gothic sovereignty; instead the emperor was content to be called a friend (amicus) to the Visigoths, while requiring them to address him as lord (dominus). Between 471–476, Euric captured most of southern Gaul. According to historian J. B. Bury, Euric was probably the "greatest of the Visigothic kings" for he managed to secure territorial gains denied to his predecessors and even acquired access to the Mediterranean Sea. At his death, the Visigoths were the most powerful of the successor states to the Western Roman Empire and were at the very height of their power. Not only had Euric secured significant territory, he and his son, Alaric II, who succeeded him, adopted Roman administrative and bureaucratic governance, including Rome's tax gathering policies and legal codes. At this point, the Visigoths were also the dominant power in the Iberian Peninsula, quickly crushing the Alans and forcing the Vandals into north Africa. By 500, the Visigothic Kingdom, centred at Toulouse, controlled Aquitania and Gallia Narbonensis and most of Hispania with the exception of the Kingdom of the Suebi in the northwest and small areas controlled by the Basques and Cantabrians. Any survey of western Europe taken during this moment would have led one to conclude that the very future of Europe itself "depended on the Visigoths". However, in 507, the Franks under Clovis I defeated the Visigoths in the Battle of Vouillé and wrested control of Aquitaine. King Alaric II was killed in battle. French national myths romanticize this moment as the time when a previously divided Gaul morphed into the united kingdom of Francia under Clovis. Visigothic power throughout Gaul was not lost in its entirety due to the support from the powerful Ostrogothic king in Italy, Theodoric the Great, whose forces pushed Clovis I and his armies out of Visigothic territories. Theodoric the Great's assistance was not some expression of ethnic altruism, but formed part of his plan to extend his power across Spain and its associated lands. After Alaric II's death, Visigothic nobles spirited his heir, the child-king Amalaric, first to Narbonne, which was the last Gothic outpost in Gaul, and further across the Pyrenees into Hispania. The center of Visigothic rule shifted first to Barcelona, then inland and south to Toledo. From 511 to 526, the Visigoths were ruled by Theoderic the Great of the Ostrogoths as de jure regent for the young Amalaric. Theodoric's death in 526, however, enabled the Visigoths to restore their royal line and re-partition the Visigothic kingdom through Amalaric, who incidentally, was more than just Alaric II's son; he was also the grandson of Theodoric the Great through his daughter Theodegotho. Amalaric reigned independently for five years. Following Amalaric's assassination in 531, another Ostrogothic ruler, Theudis took his place. For the next seventeen years, Theudis held the Visigothic throne. Sometime in 549, the Visigoth Athanagild sought military assistance from Justinian I and while this aide helped Athanagild win his wars, the Romans had much more in mind. Granada and southernmost Baetica were lost to representatives of the Byzantine Empire (to form the province of Spania) who had been invited in to help settle this Visigothic dynastic struggle, but who stayed on, as a hoped-for spearhead to a "Reconquest" of the far west envisaged by emperor Justinian I. Imperial Roman armies took advantage of Visigothic rivalries and established a government at Córdoba. The last Arian Visigothic king, Liuvigild, conquered most of the northern regions (Cantabria) in 574, the Suevic kingdom in 584, and regained part of the southern areas lost to the Byzantines, which King Suintila recovered in 624. The kingdom survived until 711, when King Roderic (Rodrigo) was killed while opposing an invasion from the south by the Umayyad Caliphate in the Battle of Guadalete. This marked the beginning of the Umayyad conquest of Hispania, when most of Spain came under Islamic rule in the early 8th century. 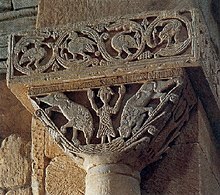 A Visigothic nobleman, Pelayo, is credited with beginning the Christian Reconquista of Iberia in 718, when he defeated the Umayyad forces in the Battle of Covadonga and established the Kingdom of Asturias in the northern part of the peninsula. Other Visigoths who refused to adopt the Muslim faith or live under their rule, fled north to the kingdom of the Franks, and Visigoths played key roles in the empire of Charlemagne a few generations later. In the early years of the Emirate of Córdoba, a group of Visigoths who remained under Muslim dominance constituted the personal bodyguard of the Emir, al-Haras. During their long reign in Spain, the Visigoths were responsible for the only new cities founded in Western Europe between the 5th and 8th centuries. It is certain (through contemporary Spanish accounts) that they founded four: Reccopolis, Victoriacum (modern Vitoria-Gasteiz, though perhaps Iruña-Veleia), Luceo, and Olite. There is also a possible fifth city ascribed to them by a later Arabic source: Baiyara (perhaps modern Montoro). All of these cities were founded for military purposes and three of them in celebration of victory. Oddly enough, despite that the Visigoths reigned in Spain for upwards of 250 years, there are a only few remnants of the Gothic language borrowed into Spanish. [g][h] The Visigoths as heirs of the Roman empire lost their language and intermarried with the Hispano-Roman population of Spain. The Visigothic Code of Law (forum judicum), which had been part of aristocratic oral tradition, was set in writing in the early 7th century and survives in two separate codices preserved at el Escorial. It goes into more detail than a modern constitution commonly does and reveals a great deal about Visigothic social structure. One of the greatest contributions of the Visigoths to family law was their protection of the property rights of married women, which was continued by Spanish law and ultimately evolved into the community property system now in force throughout the majority of western Europe. Before the Middle Ages, the Visigoths, as well as other Germanic peoples, followed what is now referred to as Germanic paganism. While the Germanic peoples were slowly converted to Christianity by varying means, many elements of the pre-Christian culture and indigenous beliefs remained firmly in place after the conversion process, particularly in the more rural and distant regions. The Visigoths, Ostrogoths, and Vandals were Christianized while they were still outside the bounds of the Roman Empire; however, they converted to Arianism rather than to the Nicene version (Trinitarianism) followed by most Romans, who considered them heretics. There was a religious gulf between the Visigoths, who had for a long time adhered to Arianism, and their Catholic subjects in Hispania. There were also deep sectarian splits among the Catholic population of the peninsula which contributed to the toleration of the Arian Visigoths on the peninsula. The Visigoths scorned to interfere among Catholics but were interested in decorum and public order. [i] King Luivigild (568–586), attempted to restore political unity between the Visigothic-Arian elite and the Hispano-Roman Nicene Catholic population through a doctrinal settlement of compromise on matters of faith, but this failed. Sources indicate that the Iberian Visigoths maintained their Christian Arianism, especially the Visigothic elite until the end of Liuvigild's reign.. When Recarred I converted to Catholicism, he sought to unify the kingdom under a single faith. When the Visigoths took over Spain, Jews constituted a large and ancient proportion of the population. Many were farmers, but they worked in a wide range of occupations, and were a major component of the urbanized population of the larger towns particularly of eastern Spain. During the period in which the Visigoths adhered to Arianism, the situation of the Jews seems to have remained relatively good. Previous Roman and Byzantine law determined their status, and it already sharply discriminated against them, but royal jurisdiction was in any case quite limited: local lords and populations related to Jews as they saw fit. We read of rabbis being asked by non-Jews to bless their fields, for example. Historian Jane Gerber relates that some of the Jews "held ranking posts in the government or the army; others were recruited and organized for garrison service; still others continued to hold senatorial rank". In general, then, they were well respected and well-treated by the Visigothic kings, that is, until their transition from Arianism to Catholicism. The political aspects of the imposition of Church power cannot be ignored in these matters. With the conversion of the Visigothic kings to Chalcedonian Christianity, the bishops increased their power, until, at the Fourth Council of Toledo in 633, they selected a king from among the royal family, a practice previously reserved for nobles. This was the same synod that declared that all Jews must be baptised. As far as the Visigoths were concerned, the time for religious pluralism "was past". By the end of the 7th century, Catholic conversion made the Visigoths less distinguishable from the indigenous Roman citizens of the Iberian peninsula; when the last Visigothic strongholds fell to the Muslim armies, whose subsequent invasions transformed Spain from the beginning of the 8th century, their Gothic identity faded. In the eighth through 11th centuries, the muwallad clan of the Banu Qasi claimed descent from the Visigothic Count Cassius. 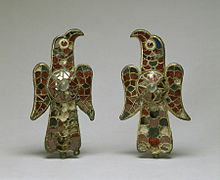 ^ "Pair of Eagle Fibula". Walters Art Museum. ^ Genethl. Max. 17, 1. ^ Vékony, 156, citing Eutropius, Brev., 8, 2, 2. ^ Other sources dispute the contents of the supposed "treaty" and claim it was a Gothic surrender. ^ The Words such as: werra > guerra (war), falda > falda (skirt) and skankjan > escanciar (to pour out); See: La época visigoda Susana Rodríguez Rosique (spanish) in Cervantes Virtual. Accessed 15 October 2017. ^ The linguistic remnants of the Gothic people in Spain are sparse. A few place names and a mere handful of well-known "Spanish" first names, such as Alfonso, Fernando, Gonzalo, Elvira, and Rodrigo are of Germanic (Visigothic) origin. ^ At least one high-ranking Visigoth, Zerezindo, dux of Baetica, was a Catholic in the mid-6th century. ^ Cf. the extensive accounts of Visigothic Jewish history by Heinrich Graetz, History of the Jews, Vol. 3 (Philadelphia: Jewish Publication Society of America, 1956 reprint ), pp. 43–52 (on Sisibut, pp. 47–49); Salo W. Baron, A Social and Religious History of the Jews, Vol. 3 (New York: Columbia University Press, 1957), pp. 33–46 (on Sisibut pp. 37–38); N. Roth, Jews, Visigoths and Muslims in Medieval Spain: Cooperation and Conflict (Leiden: Brill, 1994), pp. 7–40; Ram Ben-Shalom, "Medieval Jewry in Christendom," in M. Goodman, J. Cohen and D. Sorkin, The Oxford Handbook of Jewish Studies (Oxford: Oxford University Press, 2002), p. 156. ^ a b Waldman & Mason 2006, p. 843. ^ Heather 1998, pp. 52–57, 300–301. ^ Waldman & Mason 2006, pp. 843–844. ^ Claude 1998, pp. 119–120. ^ a b c d e Wolfram 1988, p. 24. ^ a b c d e f g Wolfram 1988, p. 25. ^ Heather 1998, pp. 300–301. ^ Wolfram 1988, p. 387, fn52. ^ a b Wolfram 1988, p. 387, fn57. ^ Heather 1998, pp. 52–57, 130–178, 302–309. ^ Collins 2004, pp. 22–24. ^ a b c Wolfram 1988, p. 26. ^ Wolfram 1988, pp. 387–388, fn58. ^ a b Wolfram 1988, p. 387, fn58. ^ Stevenson 1899, p. 36, fn15. ^ Wolfram 1997, p. 39–40. ^ Todd 2000, p. 149. ^ a b Waldman & Mason 2006, p. 844. ^ Wolfram 1997, p. 42–43. ^ Todd 2000, pp. 149–150. ^ Wolfram 1988, pp. 42–55. ^ Odobescu 1889, p. 1-100. ^ Georgescu 1991, p. 11. ^ a b Todd 2000, p. 150. ^ Todd 2000, pp. 150–151. ^ Todd 2000, p. 151. ^ Todd 2000, p. 152. ^ Waldman & Mason 2006, pp. 844–845. ^ Fuller 1998, p. 55. ^ a b Waldman & Mason 2006, p. 845. ^ Durant 1950, p. 24. ^ Durant 1950, pp. 24–25. ^ Sarris 2002, p. 36. ^ Halsall 2007, pp. 178–179. ^ Halsall 2007, p. 179. ^ Todd 2000, p. 154. ^ Halsall 2007, pp. 179–180. ^ Halsall 2007, pp. 180–181. ^ Burns 2003, pp. 322, 374. ^ Heather 2013, pp. 153–160. ^ Heather 2013, pp. 183–223. ^ Frassetto 2003, pp. 204–205. ^ Halsall 2007, pp. 214–217. ^ Collins 1999, pp. 63–65. ^ Williams 2004, p. 51. ^ Heather 2005, p. 434. ^ Sivan 1987, pp. 759–772. ^ Burns 2003, p. 382. ^ Wolfram 1988, pp. 186–187. ^ Frassetto 2003, p. 358. ^ Bury 2000, pp. 211–212. ^ a b Waldman & Mason 2006, p. 846. ^ Frassetto 2003, pp. 358–359. ^ a b c Carr 2004, p. 421. ^ Todd 2000, p. 165. ^ Bury 2000, p. 213. ^ a b c Frassetto 2003, p. 359. ^ Heather 2013, p. 70. ^ Wolfram 1988, pp. 243–245. ^ Heather 2013, p. 93. ^ Wolfram 1988, p. 245. ^ Heather 2013, p. 94. ^ Roberts 1997, pp. 82–85. ^ Roberts 1997, p. 82. ^ Collins 2000, pp. 51–53. ^ Arce 1999, p. 4. ^ Roberts 1997, pp. 96–100. ^ Williams 2004, p. 60. ^ Wolf 2014, pp. 14–15. ^ Todd 2000, p. 175. ^ Nadeau & Barlow 2013, pp. 28–35. ^ Collins 2004, pp. 6–8. ^ Coolidge 2011, pp. 17–25. ^ Wolfram 1997, pp. 58, 66, 72–74. ^ James 2009, pp. 215–225. ^ Wolfram 1997, pp. 75–79. ^ Heather 2013, p. 325. ^ Wolfram 1997, pp. 265–269. ^ Frassetto 2003, p. 304. ^ Mathisen & Sivan 1999, p. 40. ^ Graetz 1894, p. 44. ^ Gerber 1992, p. 9. ^ Roth 1994, pp. 35–40. ^ Waldman & Mason 2006, p. 847. ^ Collins 1999, pp. 211–212. ^ Collins 2000, p. 60. ^ Gonzalez-Salinero 1999, pp. 140–147. ^ Lim 1999, pp. 209–210. ^ Collins 2000, pp. 60–62. ^ Fletcher 2006, p. 45. Burns, Thomas (2003). Rome and the Barbarians, 100 B.C.–A.D. 400. Baltimore, MD: Johns Hopkins University Press. ISBN 978-0-80187-306-5. Collins, Roger (1992). Law, Culture, and Regionalism in Early Medieval Spain. Great Yarmouth: Variorum. ISBN 0-86078-308-1. Collins, Roger (1995). The Arab Conquest of Spain, 710–797. Cambridge, MA: Blackwell Publishers. ISBN 978-0-63119-405-7. Collins, Roger (2004). Visigothic Spain, 409–711. Oxford: Blackwell Publishing. ISBN 0-631-18185-7. Coolidge, Grace (2011). Guardianship, Gender, and the Nobility in Early Modern Spain. Surrey and Burlington, VT: Ashgate. ISBN 978-1-40940-053-0. Durant, Will (1950). The Age of Faith. The Story of Civilization. IV. New York: Simon and Schuster. ASIN B000HFCEIO. Fletcher, Richard (2006). Moorish Spain. Berkeley, CA: University of California Press. ISBN 978-0-52024-840-3. Fuller, J.F.C. (1998). Armaments & History. New York: Da Capo Press. ISBN 978-0-30680-859-3. Georgescu, Vlad (1991). The Romanians. A History. Columbus: Ohio State University Press. ISBN 0814205119. Gerber, Jane (1992). The Jews of Spain: A History of the Sephardic Experience. New York: Free Press. ISBN 978-0-02911-573-2. Graetz, Heinrich (1894). History of the Jews. Vol. III [From the Revolt Against the Zendik (511 CE) to the Capture of St. Jean D'acre By the Mahometans (1291 C. E.)]. Philadelphia: The Jewish Publication Society of America. ASIN B000JRBM60. Heather, Peter (1998). The Goths. Oxford, UK: Blackwell Publishers. ASIN B00RWST3HE. Heather, Peter (2005). The Fall of the Roman Empire: A New History of Rome and the Barbarians. Oxford and New York: Oxford University Press. ISBN 978-0-19515-954-7. Heather, Peter (2013). The Restoration of Rome: Barbarian Popes and Imperial Pretenders. Oxford and New York: Oxford University Press. ISBN 978-0-19936-851-8. James, Edward (2009). Europe's Barbarians AD 200–600. New York: Routledge. ISBN 978-0-58277-296-0. Katz, Solomon (1955). The Decline of Rome and the Rise of Mediaeval Europe. Ithaca, NY: Cornell University Press. ASIN B002S62FYI. Nadeau, Jean-Benoit; Barlow, Julie (2013). The Story of Spanish. New York: St. Martin's Press. ISBN 978-0-31265-602-7. Odobescu, Alexandru (1889). Le Trésor de Pétrossa. Étude sur l'orfèvrerie antique. Paris: Éditions J. Rothschchild. Ostler, Nicholas (2006). Empires of the Word: A Language History of the World. New York: Harper Perennial. ISBN 978-0-06093-572-6. Roberts, J. M. (1997). A History of Europe. New York: Allen Lane. ISBN 978-0-96584-319-5. Roth, Norman (1994). Jews, Visigoths, and Muslims in Medieval Spain: Cooperation and Conflict. Leiden, New York, Köln: Brill. ISBN 978-9-00409-971-5. Sivan, Hagith (1987). "On Foederati, Hospitalitas, and the Settlement of the Goths in A.D. 418". American Journal of Philology. 108 (4): 759–772. Stevenson, W. H. (1899). "The Beginnings of Wessex". The English Historical Review. Oxford, UK: Oxford University Press. 14 (53): 32–46. JSTOR 548095. Todd, Malcolm (2000). The Early Germans. Oxford, UK: Blackwell. ISBN 978-0-63119-904-5. Williams, Mark (2004). The Story of Spain. San Mateo, CA: Golden Era Books. ISBN 978-0-97069-692-2. Wolf, Kenneth Baxter (2014). Christian Martyrs in Muslim Spain. Cambridge and New York: Cambridge University Press. ISBN 978-1-10763-481-7. Wolfram, Herwig (1988). History of the Goths. Berkeley: University of California Press. ISBN 978-0-52005-259-8. Wikimedia Commons has media related to Visigoths.